Merry Christmas From Gary Knapp! Please enjoy the attached photo. Saturday night's do not usually find me trackside, for one reason or another, however, with the fresh snowfall(s) and mild (relatively) temps., it became obvious to me it was'nt the night to hang out at the comound. Driving north up I89, bound for CPR's D&H North End, you can imagine my delight at overhearing NECR's 324 departing St. Albans behind the 3847! Any plans for the night were redirected! After a short "stakeout" at the Georgia Whey Plant crossing, 324 passed by with 3853 trailing 3847 along with a leased ex-FEC SD 40-2! An exceptional locomotive consist. It's not the norm to find a pair of the original GP 38's working together. 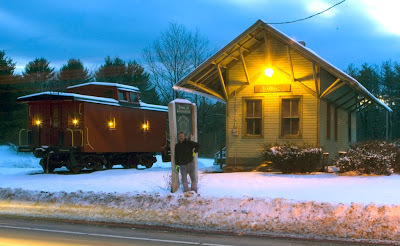 So back southbound I drove, choosing to set up at South Royalton, perhaps the quintessential Vermont village, to showcase the pair of NECR 3800's. After a slow cruise down I89, respecting the snow covered highway and "more slower" drivers, I arrived at the town green here, entering into a different world. Bare trees adorned with christmas lights, fresh snow plowed into huge piles, the buildings, and up in back, the railroad! Not knowing how far ahead of 324 I was after the slow drive, I quickly set-up the lighting around the green, then the freight house and railroad, getting in some exercise wading around the green in knee deep snow. After shooting the first test shot at 02:15, it became apparent all the twenty or more propane tankers I had noticed in the trains consist were bound for Montpelier Jct. north of me, as it would be two hours before "train time" here. Providing opportunity to be grateful for being able to capture the upcoming moment, the setting in front of me, on a Sat. night, now Sunday morning no less. 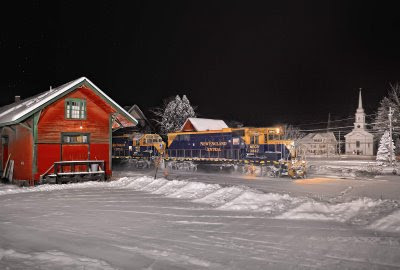 This is the first opportunity I can recall to return here in winter, to shoot again the night photo scene the editors of TRAINS Magazine chose as one of the 100 best railroad photos! What a year! While tonight features less snow flying, and more on the ground, we also have the pair of NECR GP 38's, as opposed to the lone 3848 leader in the earlier photo. The longer you wait, the better you get at ignoring the train sounds your mind produces from time to time. So it brought a big smile to my face, when I heard the real thing, non-turbocharged EMD's echoing among the hills as 324 approached South Royalton. Within two minutes engineer Jeff Howard (who we last saw at Mud Pond, eh? )brings 324 downgrade out from behind the freight house and into the scene. The 3800's pulling well, exhaust echoing between the buildings, were a delight to the ears, the moment a delight to the eyes, the photo a Christmas Card from along New England Central in Vermont! Shot on December 21, 2008 at 04:45 with Canon's 5D, (ISO 1600 & 1/200) and Zeiss ZF 28/2 (Nikon) lens set at f2.8. Please enjoy! Comments are welcomed. Merry Christmas From Kings Station! Tony Bucca in front of Kings Station and the D&H caboose, Merry Christmas!